Hi! It’s Christina with a cool card created from the Sapphire Basic Set A. 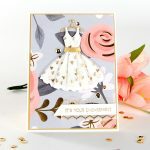 These small dies can produce the prettiest of cards for you. The Sapphire dies can be used with the Grand Calibur, as well as, the Sapphire machine, or any die cutting machine you have. 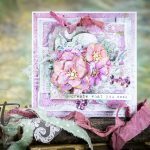 Embellish with items from your “Stash” to make a card to suit any occasion. 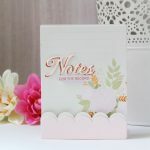 Place the Square dies #2 3 &4 from the Sapphire Basic Set A onto your card and tape in place, so they don’t move, cut and emboss. This will give you the frames you need for the card. Add thin peices of foam tape to the sides of both frames. Add the Tag to the bottom of the card and wrap the ribbon around the back and secure in place. They can now be added to the base card. Flowers, Ribbons and Pearls for more inspiration. A new Tuesday Tutorial is added every week.